The Ontario Federation of Agriculture (OFA) recently signed a letter of support for Ontario Farmland Trust’s (OFT) new strategic plan and Farmland Forever funding campaign. They did this on behalf of their members, Ontario farmers, calling the action a united front for farmland preservation. 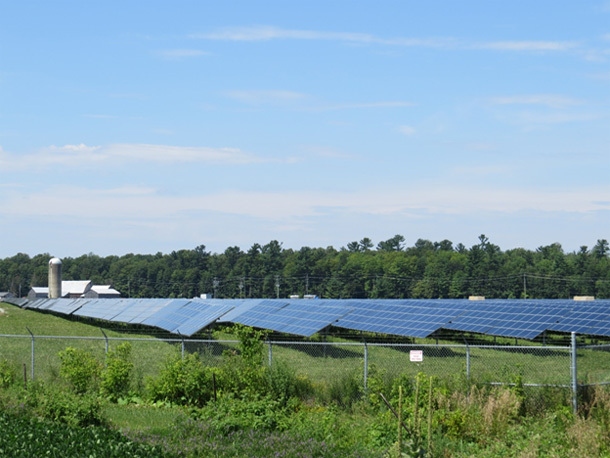 The Arnprior Solar Farm near Galetta, Ontario consists of 312,000 solar panels covering 81 hectares of what was previously farmland. Like the gift horse presented to the Trojans by the Greeks, OFT’s plan should be carefully scrutinized before accepting it. According to their website, OFT is a non-profit, charitable organization whose mission is to protect and preserve farmland and the associated agricultural, natural and cultural features of Ontario’s countryside for the benefit of current and future generations. Their primary activity is to “Direct land protection (and securement) through conservation easements and land donations”. Loosely translated, the message is that in order to have farmland preserved, you should turn your property over to conservation authorities and municipal governments to manage your land as they see fit. Now, when was the last time you caught a conservation authority protecting farmland? You might want to ask the farmers in the North Gower area in Ottawa or those in Bradford where crops were lost due to flooding while the conservation authorities were making sure there was enough water for fish and boating. Through their Land Securement Program, OFT works with farmers and other rural landowners to ensure their land remains available for agricultural and conservation uses in the long-term. Landowners can donate their land to OFT to ensure it is protected for agriculture and conservation forever. Under OFT’s model, Land Trusts are managed by a volunteer Board of Directors made up of “citizens who want to be involved in volunteering for a public purpose that is positive, practical, and oriented toward conservation”. The “gift” being presented here is the illusion that OFT will preserve the land for the landowner in a manner in which he or she envisioned. In some cases, charitable tax receipts are offered for the easement value “donated” to the trust. In Ontario, 87% of all land is public, that is, owned by the government. Of the 13% that is privately held, about 45% is farmland, mostly in southern Ontario. Is it really in the best interests of future generations to be dedicating even more land to government control? There is no guarantee that the land will continue to be used for agriculture. The One Bay Area Plan in California near San Francisco where private property is being severely restricted or declared completely off-limits is a clue to where we are heading. Is this the type of Agenda that we want to support? Conservation authorities with the support of municipalities are more interested in applying restrictions on farmland than in protecting it. Our great country was built on private property ownership and the inalienable right to use and enjoy our property. Through restrictive legislation and programs like Farmland Forever, we are moving away from this democratic principle of private property ownership towards a more socialist ideology of collective property management. OFT’s website speaks of the loss of valuable farmland in Ontario, suggesting that they should be given the job of preserving what is left. It would be interesting to know how much agricultural land and farming has been lost to environmental legislation, windmills and solar panels such as the one near Galetta, Ontario. It is disappointing to see the OFA support OFT’s programs while not taking a stand against restrictive legislation such as the Species at Risk Act and the Green Energy Act. The best stewards of our farms are those that live on the farms, work the land and grow our food – our farmers. Beware of the Trojan horse in the guise of a farmland trust or a conservation easement.